Look which global sporting superstar brought a knockout surprise for kids in Sheffield last night! Champion boxer Anthony Joshua packed a punch with children at a training session in Sheffield as he prepared to defend his world title. Youngsters using the Woodbourn Road athletics stadium on Tuesday night shared the track with the sporting icon, who takes on New Zealander Joseph Parker in a title unification bout at Cardiff on March 31. 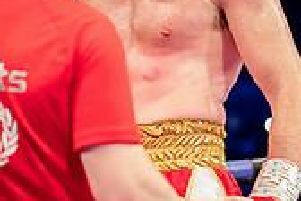 The 28-year-old, who won his first world title in 2016 and defended it in a gruelling clash with Wladimir Klitschko last year, has made Sheffield his training base again following a successful camp in the steel city last year. Sheffield's English Institute of Sport's world class facilities have been regularly used by GB Boxing amateurs and professionals for years. A short distance away, champ AJ posed for photographs and selfies with young athletes after his outdoor track session and signed autographs. Pictured: Kieran Hawley, aged 11, from Treeton, who spotted AJ after a sprint session. *More than 70,000 tickets have been sold for Joshua's return to the Principality stadium - just hours after going on sale.